It has been almost three years since RES Software released RES PowerFuse version 7.03 (also called RES PowerFuse 2005). In November 2007 RES finally released the new version: RES PowerFuse Series 8. For this version RES Software completely rebuilt the code of the product and changed the infrastructure. 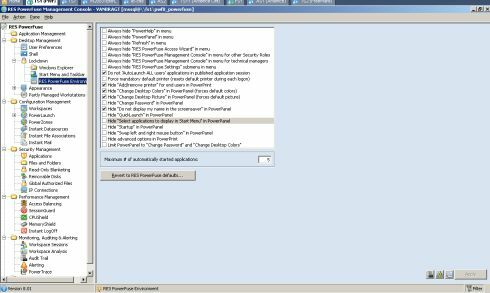 Earlier versions of RES PowerFuse used a file share (combined with a database) where configuration settings were stored. In RES PowerFuse Series 8, they changed to a completely different model using a database to store all configuration settings. Clients will cache the complete configuration set locally, so that clients can operate normally even if the database is down. After the initial caching of the full configuration set, the database and the local caches will only exchange new or changed data. It is now also possible to replicate the database to other sites using SQL techniques (and to connect devices to this replicated database logically). With the new infrastructure it is now possible to manage Terminal Servers, workstations and laptops using one configuration database. Besides this complete redesign of the RES PowerFuse back-end behind RES PowerFuse they also added about 200 enhancements in the product. Just like the older version, the RES PowerFuse installation package consists of a single MSI file. During the installation only the license agreement and the destination location need to be specified. After this installation the system needs to be restarted, because the appguard driver acts at kernel level. After the restart you can start the RES PowerFuse Management Console (previously called the Real Enterprise Manager) to create the database. (RES PowerFuse supports MS SQL [Express], Oracle, DB2 and MySQL). This is done via the Create button, which presents a wizard. Obviously, you need an account which has sufficient rights on the SQL server. After creation of the database, you can add other machines to the RES PowerFuse configuration by simply filling in the information about the existing database and then clicking the Connect button. RES Software delivers a good installation guide which describes the installation steps and the requirements in detail. The same document also describes the possibilities for unattended installations, including automatically creating the database for the first machine and automatically connecting to the existing database for the following systems. All configurations settings are configured from a single point of administration, which has been renamed in RES PowerFuse Series 8. It is now called the RES PowerFuse Management Console - a much logical name than the previous Real Enterprise Manager. At first glance, if you already have some experience working with RES PowerFuse, you might think that not much has changed in the administrator console. But if you open one of the components, you will see that the configuration screens have changed a lot. RES PowerFuse no longer uses the tab-based windows, but now uses a kind of categories. Personally I like this style, because the settings seem more orderly to me. Let's walk through the features that are available in this version of RES PowerFuse. For those of you who already know RES PowerFuse I will mention which new features are available per component. In Application Management, the application environment is set up for the users. The main task of Application Management is to set up the Start menu for the users with all the applications. Applications can be assigned through OU membership or Group membership, or can be controlled by Application Manager(s). In this node, numerous options can be configured for the applications, such as shortcuts on the desktop, QuickLaunch bar, startup style, and linking many other configurable items (mentioned further on in this article) to a specific application. You can disable an application in such a way that the users will still see it in their Start menu, but with a red cross; and when the user clicks on the application a nice customable message will be displayed explaining that the application is disabled. Also you can configure RES PowerFuse to check if the application is available on the client, if not the application will not be displayed. Administrators who already work with RES PowerFuse will notice some new options in this part, such as WorkSpace Control and User Preferences (described later on), but mostly this part has been kept the same as in earlier versions. The RES PowerFuse shell is still available in RES PowerFuse Series 8. In comparison with the default Microsoft shell, the RES PowerFuse shell is already restricted, so this shell delivers a pretty secure user environment without the need to lockdown this shell with GPOs. It is very important to test thoroughly with this shell, because some applications and Internet Explorer plug-ins do not function properly in other shells than the default Windows shell. 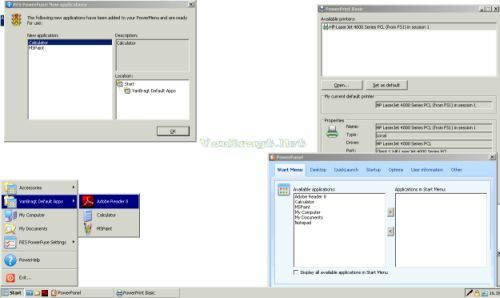 Within Desktop Management you can configure and lockdown the Windows Explorer (shell), configure Start Menu and Taskbar settings and configure the desktop and screensaver for the users. You can configure different desktop and/or screensaver images based on variables. The Partly Managed Workstations feature introduced in version 7.03 is also available in RES PowerFuse Series 8, in exactly the same form. With this feature, you can grant specific users the freedom to install software themselves. When a user installs new software, he can choose whether the new software will be available only to him or to all users that log on to that workstation. All user actions are logged and can be reviewed in the RES PowerFuse Management Console. Users must have local administrator rights on the workstation for this function to work. RES PowerFuse Series 8 introduces two new features in Desktop Management. The first one is the possibility for the user to compile a personal start menu. Within PowerPanel the user can select applications to be presented in his Start Menu, out of the list of applications to which he is granted access. This will be useful if users have lots of applications assigned (for example students at a university) and actually use just a few of them. Of course this option can be switched off if not needed. The second new feature is quite another category. In RES PowerFuse Series 8, RES Software introduces User Preferences. User Preferences is the RES Software implementation of a Flex/Hybrid Profile solution. 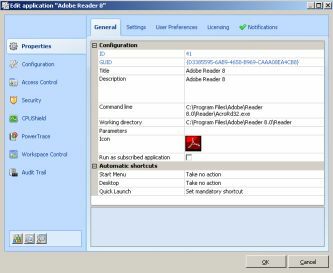 It works the same as other Hybrid/Flex Profile products using a mandatory profile and then specifying which registry keys/values and user profile directory/files should be retained. Configuration Management is the core of the RES PowerFuse product. Settings available in this component will be used throughout the complete RES PowerFuse configuration. In PowerLaunch the following settings can be set: Environment Variables, Drive and Port Mappings, Drive Substitutes, Network Printers, User Registry, and External Tasks. By using PowerLaunch, you actually configure the user environment for the users. Every setting can be applied at the following levels: Global (for everyone), per OU, per Group, per User, per PowerZone and per Application. Printers can be connected using Client names. The User Registry level has an option to configure settings on Language level. If you have previous experience of RES PowerFuse you will notice that the view of the settings is changed. Now all settings are displayed in a single view, independent of the configured access control. PowerZones were already powerful, but RES PowerFuse Series 8 enhances the possibilities even more. PowerZones can now be nested to create more specific rules. For the people who are new to RES Powerfuse: a PowerZone consists of one or more rules. Settings that are linked to PowerZones will only be applied if the criteria are met in the user's session. PowerZones are often used to assign printer to the users. Another nice option is to specify a back-up printer for each printer that is defined in RES PowerFuse. In the User Registry you can also import ADM templates, which means that configuration for user settings in a GPO is no longer necessary. RES PowerFuse can also automatically configure MAPI (Outlook) and ODBC settings and Instant File Associations. These configurations should be assigned to an application in Application Management. assign end users to specific clients; to restrict security roles to a workspace, and to display (filtering) only specific clients. In comparison with the previous version, Security Management has not changed much. Within the Application feature, you can control the end user's possibilities to start applications and executables. Every application that is specified in the Start menu is automatically allowed to start. If you set this feature to Learning or Enabled mode, all other executables will be logged. In Enabled mode, all other executables will blocked and cannot be started. The log file is available in the console and enables you to authorize executables. The File and Folder section can block unwanted files from starting in the RES PowerFuse environment. With Read Only Blanketing, local drive access can be configured to be read-only in the Terminal Server session. The usage of Removable Disks (floppy-disks, CD-ROMs, and USB-sticks) on workstations can be controlled. In this section RES Software also introduces a new feature called IP Connections Security, which uses the new NetGuard driver. With IP Connections Security, you can use access control to determine which hosts, IP-addresses or IP-ranges (and port level) specific users are allowed to access. Access Balancing: Defines how many users can log on simultaneously. This helps to prevent overloaded servers during busy logon hours. SessionGuard: Controls which users may start more sessions and passthrough sessions. CPU Shield: CPU management by lowering the priority of processes that use too much of the CPU, as defined in RES PowerFuse. Memory Shield: Optimizes memory and specifies the maximum amount of memory usage per session and maximum applications per session. Instant LogOff: Takes care of user profiles that fail to unload when registry handles are not closed by certain applications. This part does not configure the user environment, but the RES PowerFuse environment. The configuration for the database can be found here, configuration of the support for Directory Services (NT4, ADS, Novell), and licenses. Delegation of control can also be configured here using Security Roles. New within the Security Roles features is Scope Control. Scope Control allows you to configure the scope of a security role. By assigning security roles with a specific scope, you can delegate control over specific settings in the RES PowerFuse Management Console to other administrators based on access control criteria (settings) and/or workspaces (workstations). Earlier RES PowerFuse version integrated with Citrix Presentation Server and Microsoft SoftGrid. RES PowerFuse now also integrates with Citrix Streaming Server, Thinstall support and Altiris SVS. Also new is the integration with RES Wisdom (the other product by RES Software for IT automation), which makes it possible for example to install applications on clients on the fly if a file is opened but the associated application is not available. Another new feature is called Custom Resources. With this feature you can replicate files and folders to local machines for use in other RES PowerFuse parts, for example external tasks. As mentioned in the beginning of this article, clients have a cache of the configuration data that is stored in the database. The clients poll the database for changes. When a change is there (using GUIDS to identify changes), the client will synchronize this part of its cache. Although only changes in the component will be synchronized, this behavior can create a high load on your database server and/or your network links. For this reason, an update schedule can be configured the RES PowerFuse Agents section of the Datastore node. And finally, you can configure some advanced settings, view the general error log, and add languages in order to support users in their native language. With Instant report you can document your environment with a few mouse clicks. You can select which part you would like to see in the report. Instant Reports generates documentation in a PDF format. With Building Blocks you can export your configuration into an XML file. This file can be imported into other RES PowerFuse environments - ideal if you have a DTAP environment. In this way for example a new application configuration can be imported and exported during your change process in all the environments. Building Blocks can also be a backup for your environment. All management tasks can be found in the part now called Monitoring, Auditing and Alerting. If you are already familiar with RES PowerFuse, you will notice one of the enhanced features called Alerting. It is now possible to send an alert using e-mail or SNMP, or you can configure an external task or Wisdom task to start as an automatic reaction to an alert. PowerTrace gives an overview of the usage of the environment, presented in graphs and tables. The former features Active Users and Access Control List are now called Workspace Sessions and Workspace Analysis, but offer the same functionality. Workspace Sessions shows the currently connected users with all kinds of information about the user and the sessions, while Workspace Analysis gives a wonderful overview per user of the assigned settings and their order. This is very useful when troubleshooting user questions. All changes to the configuration are displayed in what is now called the Audit Trail (previously called Modification Log). PowerHelp enables users to find their applications easily or read the description that you added to the application. Users can use PowerPrint to view their available printers and connect printers to their sessions. PowerPanel helps users to configure their user environment. For example, users can add application shortcuts to their Desktop, QuickLaunch or startup folders. Users can also change their screensavers, mouse settings, language of the environment, and more (if not blocked by system management). The option to personalize the Start Menu is also found in PowerPanel. With RES PowerFuse Series 8, RES Software has taken the logical next step towards managing the complete user front end (workstation, laptop and Terminal Server) from one console. In my opinion, this is definitely the right step, because those systems are really growing ever closer to each other (especially with the upcoming VDI solutions). The new infrastructure RES PowerFuse is more Enterprise-ready, because it is can support more users and branch offices much more easily. Happily, RES Software is still the same company which really listens to the wishes of its customers. In this version they have implemented the profile solution I asked for in the RES PowerFuse 7.0.3 review and the personalized Start Menu is a request from one of my customers. In summary, the new version is really a big improvement, although there are some new considerations such as the synchronization interval and the replication of databases. It is also a pity that you can configure multiple configuration sets for some components like Performance Management out of the GUI. There is a ADM template based on Current User setting available, which overwrites the default PowerFuse Settings. In combination with PowerZones you can configure more sets, but I would like to see this option within the GUI it selves preferable. Also, if you compare similar products you will still find features that are better implemented in one of those products. Easy interface and single point of administration makes administration of Terminal Server Infrastructure, workstations and laptops easier. Easy steps for OTAP environments with Building Blocks. Version 8 is Enterprise ready (scalability). There are database administrators who do not like the idea of all clients connecting directly to the database. The default synchronization interval can cause SQL server(s) and WAN links to be overwhelmed. Some features cannot be configured differently for workstations, laptop and terminals out of the console.